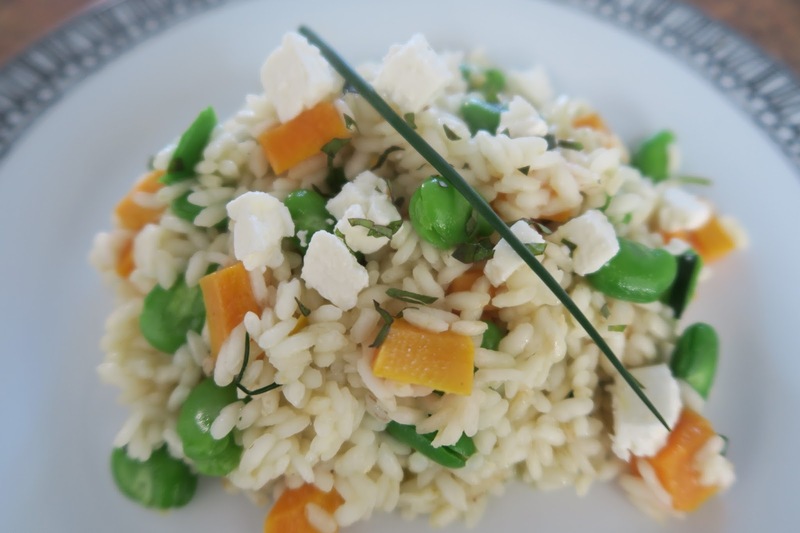 A light dish for a summer evening this broad bean and feta risotto with sweet potato will bring a taste of summer to your table even if it's raining outside. I took this handful of broad beans from next doors garden, the house is empty and for sale. All the strawberries have rotten on the plants and I couldn't watch the broad beans go the same way. I stood debating whether to take the broad beans for some time, the previous tenant had asked me to keep an eye on the garden but it's not technically his house any more and I don't want to have a run in with a potential new owner. After deciding they'd only go to waste if I didn't rescue them I knew I had to put them into a worthy dish. I gathered chives and lime mint from my own garden and this dish was born. Add the rice, water, potato, stock and half of the chives to a large pan. Simmer for 20 minutes. Don't let the pan dry out, add more water a little at a time if needed. You want the risotto rice to be soft and fluffy with a little thick stock remaining. Two minutes before removing from the heat add the shelled broad beans. Put the risotto onto plates and sprinkle with the lime leaves, the remaining chives and crumbled feta. Enjoy with a glass of chilled white wine. It was definitely worth rescuing the broad beans for the dish.